Anyway, one of the things I like in FF is the ability to extend its abilities with add-ons. Mozilla.org offers lots of one-click-install add-ons. Gmail Manager is one of the best add-ons out there. A delight. 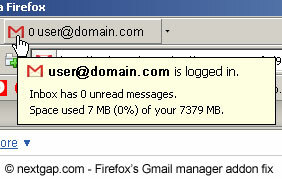 It adds an envelope icon to Firefox toolbar. Red envelope means there is no new mail. Blue envelope let’s you know you received new mail. It also let’s you know the number of unread emails. You can set it to play any sound too (You can use the built in Windows wav sound for new mail: C:\WINDOWS\Media\notify.wav). Clicking on the envelope opens your inbox. Or you can just roll over the envelope to take a glimpse of the new mail (subject). After adding it, restart FF and right click on the top gray area of the browser (the toolbar) and choose “customize” . A list of items will appear, one of them the Gmail Manager. Drag it to the toolbar to activate. you can place it in the address bar row or the top menu row on either side you want. Adblock Plus – is a nice ad blocker that can be adjusted manually to block certain content from a site you visit a lot. It can use a subscription of your choice too. What it’s also good at is blocking yourself from your own statistics. for ex, excluding yourself from Google analytics. Why would you want that? If for example you own a few websites, and you want to exclude yourself from Google analytics (or other: gostats.com, etc) counting your own visits , Adblock can do that by letting you manually add a filter. What that does is blocking the statistic script from loading. AutoFillForms – Autofill Forms enables you to fill out web forms with one click or a keyboard shortcut. You just fill a form, then save it as a profile, and whenever you have to fill that form again in the future, you just click the pencil icon, and the form is filled. IE Tab lets you view any web page on FF, but using the Internet Explorer (IE) engine, whatever version you got installed. It’s good for some sites that were designed for IE only without taking into consideration that it’s not the only browser.So instead of opening IE, you just right click on the tab you want to switch, and choose “switch rendering engine”. You can also make rules to some sites that you frequently visit, so FF will automatically use IE engine to view them. Flash Video Resources Downloader lets you download videos from online flash video sites (Youtube, Google Video & all the rest). Reload Every – Allows you to stay online to certain sites (that log you out, after a short period of inactivity) . What it does, is reload/refreshes any web page, every 5 minutes or as you choose. There are of course numerous types of add-ons for just about anything you can think of. I use only a few and some of them rarely, so what I do is deactivate what I do not use daily . For ex, the Firebug add-on: I don’t inspect HTML and CSS everyday, so why have FF start with it? any active add-on uses more resources. Found a cool add-on, feel free to add a comment!